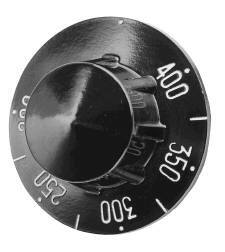 Vulcan Thermostat, TYPE - SJ - TEMP 175-550 - BULB 3/16" X 11-5/8" - CAP 42" -- TYPE 1 Vertical MOUNT, W/ AUX SWITCH WAS TYPE - K -- TEMP 175-550 - BULB 3/16" X 11-5/8" - CAP 60" TYPE 1 Vertical MOUNT -- OEM PREVIOUSLY USED K STYLE. NEW RANGES MAY USE SJ TYPE. SJ WILL WORK WITH OLD RANGES. 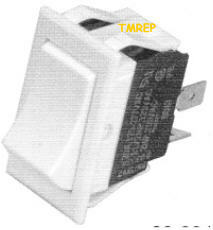 - Robertshaw Thermostat SJ-169-42 , VULCAN OVEN SERIES: E24, 36, 48, 60 W/L/LC/LCC SUFFIX,9030. VO004, VO008 OLD STYLE GRIDDLE SERIES: E24, 36, 48, 60 W/L/LC/LCC SUFFIX. Vulcan Infinite Control, 240 Volt Infinite Switch - Stem flat down - Stem Length 3/4"
Vulcan Thermocouple # 412788-00001 - 1900 SERIES HEAVY DUTY THERMOCOUPLE 18" LONG. 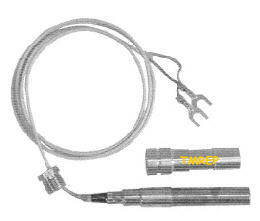 20-30 MV COAXIAL THERMOCOUPLE THREADS = 11/32"-32. VULCAN HART 00-412788-00001, 00-906955-00018, 00-921565, 112788-1, 20040, 906955-00018, 906955-18, 920040 VULCAN HART 921565 VULCAN HART GRILL G-40; SERIES: 900, 900A.- Model # 972AR , RANGE MODELS 24,36,48,481,148,60,160,260, ENDING WITH SUFFUX L, LC, LCC, SERIES: 77R, VG. 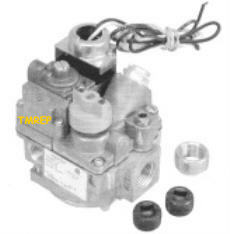 Vulcan 120 volt Gas Valve, 300,000 BTU Max --LP GAS, 1/4"CCT PILOT OUT, 120 VAC ACTUATOR, 3/4" FPT IN/OUT, W/2 BUSH 1/2" X 3/4", 120V, HAS SLOT WITH THERMOCOUPLE MAGNET, MFG# 700-454 W/LP CONV., TO MAKE THE VALVE #700-453. Vulcan Thermostat, TYPE - S -- TEMP 175-550 -- BULB 3/16" X 11-5/8" -- CAP 60" -- --Will work on RAIR OVEN SERIES: VL (OBSOLETE - BECAME THE 2000 SERIES WHICH USES A DIGITAL T'STAT). 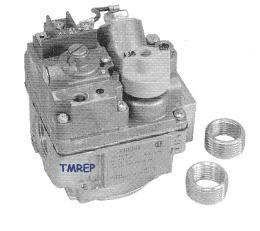 --- Fryers - Type LCH Temp 450 F , 1/4" x 4 7/8"
Heavy Duty Electric Thermostat, Type D1/D8- 100-550F - BULB 3/16" X 13" TIN/ZINC - CAP 60"- MOUNT W/ FRONT EARS, PILOT LIGHT, DIAL & BEZEL INCLUDED D1'D18 T'STAT, DPST FOR AC OPERATION, 4 TERMINAL USED IN APPLICATIONS REQUIRING HIGH CURRENT. Gas Orifice, Orifice Hood Drill Size #42 , 3/8" x 27 threads , OA length 3/4"
Gas Orifice, Orifice Hood , Drill Size # 51 , 3/8" x 27 Threads , OA Length 3/4"
LP Gas Orifice, Orifice Hood , Drill Size # 57 , 3/8" x 27 Threads , OA Length 3/4"
Gas Orifice, Drill Size 53 , 3/8" x 27 Threads , OA Length 3/4"
Vulcan Burner Orifice, Must be Drilled to your needs , Vulcan Ref. # 10901-72 , # 72 ORIFICE, DRILL TO SIZE, THREAD 16-36 UNS MEASURES .265" OD, (6.74 mm OD) THIS IS A SPECIAL THREAD. 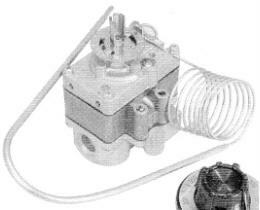 Vulcan Burner Orifice, Orifice Spud, LP (Top Orifice) ,Vulcan Ref. # 10901-00057 , #57 ORIFICE THREAD 16-36 UNS MEASURES .265" OD, (6.74 mm OD) THIS IS A SPECIAL THREAD. Vulcan Burner Orifice, Orifice Spud, Nat (Oven) , Vulcan Ref. # 10901-34 , #34 ORIFICE THREAD 16-36 UNS MEASURES .265" OD, (6.74 mm OD) THIS IS A SPECIAL THREAD. 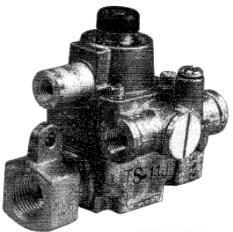 Vulcan Burner Orifice, Orifice Spud, Nat (top orifice) , Vulcan Ref. # 10901-50 , #50 ORIFICE THREAD 16-36 UNS MEASURES .265" OD, (6.74 mm OD) THIS IS A SPECIAL THREAD.